The request stopped me for a moment. I had been vaguely dissatisfied with the current literature on group psychotherapy, including my own writings. The zest and searching seemed to be gone. Instead of the adventure and excitement of the early years we were now being inundated with evermore parochial and partisan clinical points of view presented as the preferred way to function, or conversely, bitter denunciation because we were not practicing according to one another’s prescriptions. It seemed to me a new, overall look at my own life in the work might prove interesting, at least to me. So, the reader is entitled to view this essay as a reappraisal of a field which still commands my zeal and devotion. A frequent question asked by analysts of their patients is, “How did you happen to choose your life work?” Answering that question for myself, it seems to me, in retrospect, that I had sound manifest reasons for becoming interested in group therapy and for continuing my work in it. And, also in retrospect, I realize today that those reasons were not personal alone, but were also dictated by the larger forces in the world of which our craft, or science, or art, or whatever one wishes to call it, is a part. In 1938, when fairly well along in my own training as a psychoanalyst, I came across some articles by Burrow, Wender, and Schilder. These three therapists, from different points of view and for different reasons, had begun experimenting with the analytic treatment of patients in groups. Burrow stressed the need to challenge the authoritarian position of the individual psychoanalyst. Schilder was concerned with the culture’s influence on the individual, with his values and mores, while Wender occupied himself primarily with the disturbed person’s need for a community and the responsibility of the community at large to understand and, possibly, fill that need. I cannot document specifically why these papers caught my attention or commanded my interest at the time. In all likelihood some dissatisfaction with the existing psychoanalytic experience had something to do with it. Whatever the reason, I communicated this new interest immediately and enthusiastically to some colleagues who were in analysis with my own training psychoanalyst and proposed that we form our own group in order to experience for ourselves that advantages and disadvantages of group psychotherapy. My suggestion was met with a thunderous silence. Only my analyst found words to discuss the matter with me. He felt, and not without reason, that my plan was evidence of my own resistance to our analytic relationship; which is what we worked on, while my experimental idea died aborning. While I was in analytic training, the United States was in the depths of a great economic depression. Fortunately, I had been able to build a private practice in psychotherapy, but after a few years, the numbers of patients who had to be turned away because they could not afford private therapy began to haunt me. Was psychoanalysis going to turn out to be a therapy only for those who could afford it? Undoubtedly so, if no compromise could be found. At the same time, I had begun to feel that even if the process of psychoanalysis could not be shortened, it must somehow become a more immediate, dramatic, and meaningful experience for patient and analyst alike. It was then that the idea of trying to work with groups reoccurred to me. This time I was in the fortunate position of being my own “authority” and could put my idea into operation. Without being too insistent, I began to present the possibility of group therapy to the patients already in analysis with me. To my surprise I found that most of the patients shared my enthusiasm at embarking on a new adventure which had a serious base and held the promise of increased personal fruition. The original group consisted of ten patients, five men and five women. They met with me three times a week in sessions lasting one and a half hours. Shortly after the group became cohesive, they replied back to me that they were continuing their meetings in a nearby coffee shop and that many different things were being observed during these extracurricular gatherings. I saw no reason to forbid these meetings without me. And so, almost immediately, the “alternate session,” which I will discuss in more detail later, was established as an integral part of my plan for the practice of psychoanalysis in groups. This psychoanalytic orientation did not change, and now after thirty years, I still find the precepts of psychoanalysis the broadest, most reasonable base for effective group therapy. Although this personal beginning was still in the pioneering days of psychoanalytic group psychotherapy, the first actual record of group psychotherapy in the United States was presented by Dr. J. H. Pratt, a Boston physician, in 1906. Dr. Pratt, working with tuberculars who could not afford institutional care, quickly found that his classroom instruction on tubercular home care had beneficial emotional side effects. By 1956 he was referring to his work not as “Home Sanatorium Treatment for Consumptives” (1906) but as ” group psychotherapy” (1956). Between these two dates, group psychotherapy came of age. Moreno has written how he worked with groups in Vienna in 1910. Lazell reported on group treatment of psychotics in 1921. Burrow introduced the term group analysis in 1925. Wender reported on his work with psychoanalytically oriented groups in 1929, and Slavson introduced, among other noteworthy innovations, activity group therapy. In 1931, Marsh reported on his twenty years of group psychotherapy utilizing the repressive-inspirational method and the idea of milieu therapy. 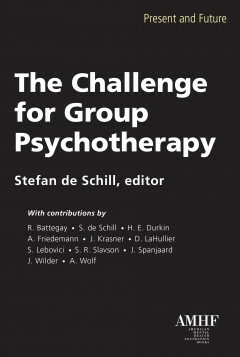 And in 1934, Schilder introduced group psychotherapy into Bellevue Hospital in New York, combining social and psychoanalytic points of view in his technique. In the postwar period, despite the misgivings of many individual therapists, the number of group psychotherapists continued to grow. Probably the last holdouts among psychotherapists were the psychoanalysts. Nevertheless, today, hardly a psychoanalytic school exists which does not admit the technique of psychoanalytic group psychotherapy to its course of training. In addition, many new schools of psychotherapy have grown up around the practice of group psychotherapy. These are discussed elsewhere in this volume in more detail. For my purposes here, a brief discussion of certain major trends may serve to clarify my own position. For example, there is the “experiential school,” which considers the immediate emotional experience of group interaction to be of paramount importance almost to the exclusion of history and working through. Some of these therapists also believe their own feelings, reactions, etc., should be exposed as freely as those of the patient. To many of this school, thinking is the enemy of therapy and rationality only a repressive and destructive influence. The group dynamicists, currently very much in vogue, are also dedicated to the “here and now” and to the supremacy of the group over the individual’s problems. They, however, are not as inclined to include the therapist as a superpatient, as it were, nor even as an authority figure above the authority of the group. Group dynamics, pioneered by Lewin, has proven itself very helpful to community organizers, educators and business organizations. However, because of its nonanalytic stance and its lack of a theory of the cause and cure of mental disorder, I have serious reservations as to its value as a method in treating the mentally and emotionally disturbed. I also find myself out of sympathy with the tendency to look on any sort of group activity as a form of group therapy. Many such activities may have constructive outcomes with no justifiable claim to being regarded as therapeutic techniques. I must confess that the heat generated at discussion of these various points of view, (to which heat I have made my own considerable contribution), on sober reflection, leaves me slightly bewildered. Anyone who has participated in group psychotherapy knows that nonverbal communication, for example, is important, provocative, disturbing, supporting, etc. Why then is it necessary or even desirable to build an academy of nonverbal communication therapy around the concept, or even to denigrate verbal communication? And why should there be any contention against the appropriate use of both? By the same token, any experienced group therapist will learn very soon that every group has a life and character of its own and that group cohesion is necessary in some measure for productive therapeutic work. But is it necessary or wise to put the group above the individual at every instance? Or at any instance? I happen to think that a group worthy of its name can often handle recalcitrance, destructiveness, or acting out on the part of members better than a single authority can. In other words a group can usually set its own limits, can interrupt its own members’ acting out. What is less hardy is the status of the individual self. And if there is a choice of emphasis, I prefer to put that emphasis on the side of the preservation of each individual’s integrity, without removing him from the group but encouraging him there to achieve effective and successful peer interaction. To this end, I have found these general precepts to be of immeasurable help. First to provide a reasonably serious, relaxed, purposeful atmosphere so that concentration and freedom to work is encouraged. This requires the setting of some ground rules which each therapist will choose according to his own personality. I prefer to make my ground rules very general for the most part and quite specific in some parts. For the general rules, I ask that each patient try to discuss his associations, reactions, fantasies, and feelings as frankly as possible, about himself, his fellow group members, his family, friends, work associates and his therapist. I ask further that the alternate meeting be considered an integral part of the therapy plan, to be attended as faithfully as the regular meetings and that any interchange which takes place outside the group setting among individual members or subgroup of members, be discussed within the group. These rules are not given as either-or propositions: either obey or get out. Nor is there any intimation of laissez faire. The instructions are given with the full knowledge that each member of the group will absorb them according to his own level of understanding, organization, degree of resistance, and attitude toward authority and peers. And the chances are excellent that collectively the group will regulate its own behavior toward constructive work. Another rule I follow for myself and indirectly impart almost immediately to the patient is that any material which is compulsively emphasized or repeatedly left out of discussion is something to be investigated and analyzed as evidence of resistance. Therefore, if a patient discusses only his family or never his family, always the therapist or never the therapist, always others or never others, always his dreams or never his dreams, only history or never history, it can be assumed that he is hiding something it would be better for him to explore. This eliminates a good deal of endless discussion about which technique is more therapeutic or more effective: here-and-now activity or probing into history, interaction or introspection, verbalization or nonverbalization. They are all important, all at some time used in the interests of self-revelation or resistance, depending on the particular situation of the particular patient at the particular moment of study. In other words I do not believe that emphasis on any one level or modality of the human being—conscious or unconscious, interpersonal or intrapersonal, interpsychic or intrapsychic, intellectual or emotional—is of any help to therapy if it willfully excludes the other levels. All are important, all must be studied as they emerge in the individual patient, to the end that more and more doors are opened for further insight into his psychodynamics and psychopathology, their effect on the group members and they on him. It is my further conviction that to practice this way requires intensive training in theory and in actual experience of both individual and group analysis. When I first started training group psychotherapists, the students were members of my heterogeneous groups. Today it is not unusual for the therapist to have his group experience with members of his own profession. I deplore this tendency as violating the true principle of heterogeneity and would very much like to see the student forego the protection of his professional peers and grapple with the problems a cluster of garden variety mortals present. In this way he will learn more about his own unconscious operations, his ability to expose himself appropriately or his need to disclose himself inappropriately, his attitude toward authority, peers and “inferiors.” Certainly the more heterogeneous and vivid the group analytic experience, the less rigidity and the more reasonable spontaneity should result. And these qualities are the sine qua non of the group analyst who is prepared to deal with the multileveled analytic design with which this essay deals. Now to some specific details of how this basic design for psychoanalysis in groups might work in actual practice. In my original writings on this subject I found that my own need for structure forced me into a “stages” design, which I feel has not proved itself clinically. Stages of therapy occur at different times with different patients. Some come concurrently, some earlier, some later. If one is conversant with the basic precepts of psychoanalysis, if one can handle one’s own transferences and countertransferences, it should not be too difficult to pursue a reasonably disciplined plan of therapy for each individual, always seen against the background of his interaction within the group. Many images have been used to describe the therapeutic group and group therapist. Some have likened the group to an orchestra with the therapist in the role of conductor. Others think of it more as a theatrical improvisation with the therapist as director. An image which often presents itself in my mind is that of a beach. The sand is always there, but every breath of wind, change of sea or faintest footfall rearranges the sand particles. To try to prearrange the configurations of sand particles according to any rigid pattern, set of patterns or stages would be futile. To maintain that these patterns, stages or even results are constant or absolutely predictable would be untrue. And what holds for the sands holds for the therapeutic group. Is there nothing for them to hold onto but shifting sands? No. Each patient has his characteristic pathology, his characteristic resistances, and a set of transferences, which he repeats over and over again. We come to know and expect these particular responses of his, behavior that typifies him, that give him a stamp, so that we learn: if we behave so, we can predict that he will react thus and so. I shall try my best to describe the process of psychoanalysis in groups as I have experienced it and as I have practiced it. Question: How does one establish a comfortable, relaxed atmosphere? The first necessity is to realize that the setting is important as a background for group members’ interaction. To use a modern colloquialism: it is the “scene.” I myself prefer to hold group sessions in a squarish room, large enough to hold a circle of ten comfortable chairs, clustered around a rather large round coffee table, a setting not large enough to substitute for a living room or small enough to be a den. In one corner is my own leather chair, quite different from the other chairs, but not ostentatiously so. There are two clocks, one in my line of vision so that I don’t have to refer to my wrist watch during the session, the other placed so that every group member can be aware of the passage of time if he so wishes. The walls are lined with bookshelves and in the single window there is an air conditioner. These may sound like petty details, but one soon learns that no details in group can be too petty. My chair, for instance has sparked more transferential hostility, speculation, and acting out than any other single item (except perhaps my “passivity”). Some patient is angry at me. Why? Because I reserve the most comfortable chair for myself (like his father or brother or mother or wherever his transferential button is). I have my own clock. What’s the matter? Am I afraid I’ll be giving them an extra five minutes and so lose some money, or maybe I’ll catch myself giving somebody something for nothing. My walls are rather dark. Is that so they won’t show the dirt? What are all those books doing on my shelves? I don’t sound as if I ever read any. Are they there just for window dressing? These slightly humorous, critical and half-truthful observations may relieve a great deal of the tension accompanying the expression of hostility and may hopefully open the door to deeper levels. In the same way I have found that a straight sofa may be “separating” in the sense that one of three people on either side may be separated from the sofa subgroup. The circle of independent chairs is part of the atmosphere we want separate but together as a group— in a room that is not overwhelmingly luxurious nor antiseptically bare. publicized; (3) want exclusive possession of the therapist;(4) fear the group will reproduce a nightmarish family situation; (5) cannot take even a breath of hostility; (6) cannot give up the illusion that their neurotic defenses are justified and should be strenghtened and encouraged rather than changed; and (7) who cannot see how a bunch of neurotics can be of any possible help to them. The well-trained therapist can allay these fears in prior individual private sessions which may number as few as one or two or stretch over more than a year. The prospective group patient should be assured that he need not reveal any intimate material until he is ready to do so. He need not even tell his last name. The patient who wants the analyst to be exclusively his can be led gradually to the insight that this is an infantile demand for the possession of the isolated parent as represented by the analyst and that the way to maturity is to learn to undo the tie to the parental figure and make a more appropriate and reasonable relation to people in and out of the group. Often, of course, such understanding is not achieved until the patient has been in group for some time. For those who fear the reincarnation of a nightmarish family, the therapist can promise and deliver a permissive protectiveness for a time, using his skill not to stifle other members of the group but to encourage ventilation of feelings, dreams, fantasies, and biographical material from the overfearful one, from the provocateur, and from the onlookers. So everyone in the group has a chance to be both participant and observer, helper and helped; each patient is encouraged to playa liberating, creative, expansive, and socializing role as he gives up his own repressive, destructive, and antisocial trends. When the patient is ready to join a group, he may ask for and be given or not (depending on whether or not the therapist believes it to be necessary in his case) brief, general, anonymous descriptions of the other members. The times of regular and alternate meetings and the fee expected are discussed. A heterogeneous group of eight to ten people is now ready to start therapeutic work. The heterogeneity of the group is a point which cannot be stressed too often, since that heterogeneity provides the structure which by its very nature promises greater reparative possibilities than could be afforded by a homogeneous group. It is worth repeating that the homogeneous group tends to defeat the individual patient, to force him into a conforming collusion which may be able to comfort him for a while, but will, in the end, betray him unless the therapist and patients struggle hard to uncover their latent heterogeneity. Every patient wishes, in some part, to justify and rationalize his neurotic maneuvers. If he is injected into an environment that largely mirrors his own disorder, or which demands identification and conformity, his resistance is fostered, and the goal of strengthening his differentiated resources is retarded. Conversely, the heterogeneous group provides a structure which by its nature has greater reparative potential because it must stir the patient to change; it must stimulate, provoke, excite, and challenge him. Diversified interaction will elicit and promote multiple transferences and at the same time help break down the rigidity of the transferential reactions, while the variety of personalities to whom he assigns projected roles will more quickly highlight the discrepancy between his distortions and reality. Despite this emphasis on heterogeneity, certain readily identifiable types are better treated individually or in homogeneous groups and are best excluded from the average heterogeneous group. Among these are: manifestly exploitative psychopaths; severe alcoholics, who cannot come to meetings sober; seriously disabled stutterers, who can exhaust the patience of other members; paranoids, who are apt to include group members in their systematized delusions; intensely masochistic patients, who manage always to seduce others into aggression; the senile, who are too out of contact; the very depressed and suicidal, who are too disturbed to tolerate interaction; the gravely autistic, who cannot become involved; the rigidly obsessive-compulsive, who are too preoccupied with their own rituals; the mental defectives, who can burden a group; and the cardiac patient, for whom the excitement and drama of group interaction might precipitate anginal spasm. The homosexual, who some therapists believe cannot be treated in a heterogeneous group, I have found to benefit enormously when included in a “general world atmosphere” and not limited to a homogeneous (homosexual) environment. And many of the types listed above can eventually be included in heterogeneous groups after individual treatment or after a homogeneous group experience. Only the cardiac patient who experiences anginal pain with affect should be kept out of any group, homogeneous or heterogeneous. Although the hypothetical group I am describing here is one that is newly formed, it is in no sense a closed group. From now on, to reinforce the principle of heterogeneity, this group will be ongoing and open-ended. If a member leaves, he is replaced by a new member. And by the same token if, for one reason or another, the group in its development becomes homogeneous in character, rigid or overconforming, it can be broken up and its members transferred to several other heterogeneous groups. To give an example of this: a homogeneous group, despite all efforts to establish a serious, working climate, prefers to act out verbally, to use banter as the prevailing tone of verbal interaction and uses the alternate meeting primarily as a social activity. These same members, split up and placed in several other groups where the work of psychoanalysis is considered paramount, quickly adjust to the new level, since consciously at least, they are suffering from their neurotic disturbances and really want therapeutic help. But to get back to our newly formed group. They are now ready for their first meeting. As far as I am concerned, this is the only group meeting which can be called typical. No matter how well prepared the participants may be, practically everyone (including the therapist) experiences some anxiety at a first group meeting. Adequate preparation has enabled the group to gather, but all the rest of the experience still lies in the realm of the unknown, which is always somewhat anxiety-provoking. The patients usually meet outside in a waiting room and introduce themselves informally. When the therapist arrives, they all enter the meeting room and seat themselves in a circle. Someone may start the meeting going by asking for clarification about the ground rules. But often each member will wait for someone else to begin. It is at this point that the therapist may routinely be expected to “get the interaction going” (one of the most frequently asked question about group psychotherapeutic technique). The therapist does this by asking the one question he can safely assume will be responded to by everyone: “Did anyone ex-perience any anxiety about coming here today?” Someone or another is bound to answer, and the likelihood is that most will be willing and eager to discuss their mutual anxieties. From that point on I, at least, have generally not found it necessary to stimulate interaction, to get it going, to initiate or to lead, or to direct group members. Whatever such qualities or tendencies I may possess, I reserve for the purposes of pursuing analytic interventions. And, as the members become more experienced and sophisticated in understanding latent content, I gradually encourage them to become more and more autonomous, intervening only when I believe it to be necessary and appropriate. I believe that analytic work can begin in the very first session, usually with the ventilation of anxiety as just described. Once interaction has started, it is not at all unusual for a patient to recount a recent dream, a recurrent dream, or an old nightmare. Failing that, the analyst encourages the telling of daydreams, fantasies, and reveries. He asks members to avoid censorship of fanciful speculation about one another’s productions. In this way the different personalities begin to emerge and the first steps are taken in the development of mutual rapport and antagonism. During these early meetings the therapist plays a more active role, contributing his own spirit of warmth and optimism by a sympathetic, permissive attitude toward each patient’s ventilating his frustrating problems, dreams, and aspirations. Gradually, the sparking of interaction will be taken over by the members of the group and the therapist will sit back more and more, letting the interaction develop and the tensions build up. Every well-structured group usually contains one or more catalytic agents ranging from the healthier patients—those who wish to do constructive work and get on with the process of mutual discovery and wholesome interrelatedness—to the more neurotically motivated provocateurs.